Getting back on track with these, thankfully. This was an “interesting” book that I had read back in the day, before I had even started using the Internet and visiting bookstores. Back when I would make frequent trips to the Greeneville Library, it got to the point that I would just pick out books by shelf, going through each one till I found one I liked. 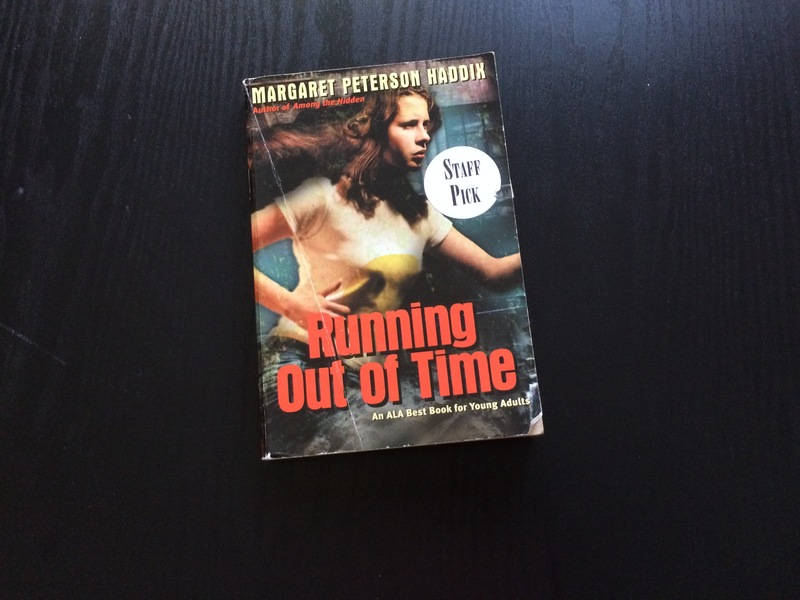 Running out of Time was one of those books. I had randomly happened upon it, the older version with the traditional art cover with half of Jessie wearing her 1800s dress and the other half wearing modern clothing. This intrigued me immediately, borrowing it and taking it home. The original cover of the book that I had read back in 2002. I love these soft-toned oil-painting covers! The story follow Jessie, a thirteen-year-old girl who’s living in an old-fashioned village that goes by the name of Clifton Village. Everyone mimics a lifestyle from the early 1800s but its unknown to her; it just seems like an everyday life to her. Right off the bat people are getting really sick with a bad fever. However nothing that they have on hand is curing it. One afternoon Jessie’s mom calls her aside, telling her that she needs to go get help. It’s revealed to her that there’s a modern and futuristic world outside the compound that she’d face. Jessie is given her mom’s old clothes and told to go contact a man by the name of Mr. Neely. Jessie gets away and manages to put a news conference together, citing Clifton Village’s plight. She passes out, turning out that she contracted the same sickness; diphtheria. Fortunately the police and everyone swoop in to put a stop to everything. Jessie is treated at the hospital and soon recovers. However, all does not go well. Two kids she knew that contracted the sickness has died. Eventually Jessie is returned to live with her parents with a few people who stay at the compound. However she now lives a double life, going to a public school and such. The story ends there. At the time, I liked the book. I found Jessie coming to grips with modern technology hilarious and entertaining. I sort of had the spark die when I learned that it was a big modern conspiracy, but that didn’t make it any less fun to read. Even 15 years later, I think its a fairly good read. had re-read it to brush up on my memory for this review, reading through it all over again with joy. It’d get 4 stars from me if I was giving it a rating. On an interesting note per a Wikipedia article, the publishing company of the book cited that there was similarities to Haddix’s book to the movie The Village. The story followed a similar plot, in that a woman living in an 1800’s society had to go outside of a compound to get help, which was the modern world of 2004. Don’t know what became of it but the movie is still around and so is the book. So most likely it wasn’t too big of a similarity to cause a fuss over. Also The Village is one of those Night Shyamalan movies. Per the author, she’s actually a well-known person. 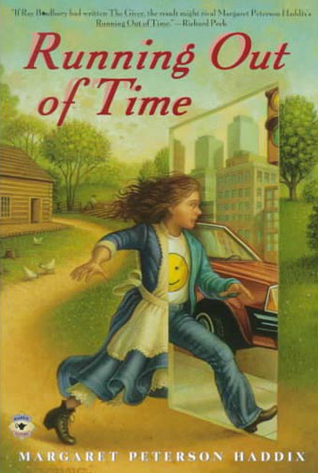 Margaret Peterson Haddix has a tendency for “locked up in an oppressive box” stories, such as her Shadow Children books. It’s not a bad trait; she’s good at what she does and it shows. She’s won awards for her writings, and Running Out of Time took 11 of them between 1995-1996. It also seemed that there was a Chinese version which I found highly impressive. 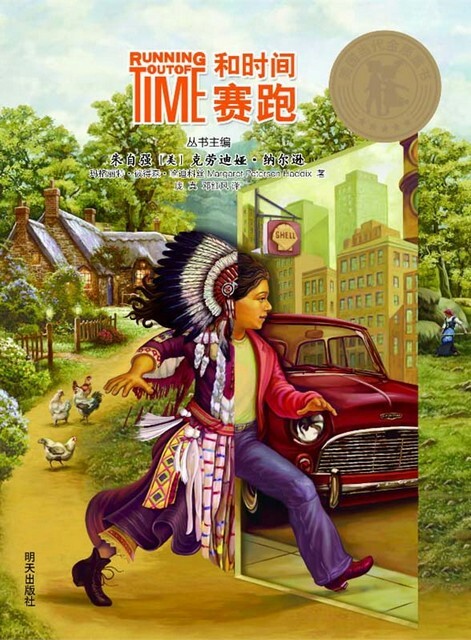 One of two version of the Chinese covers for “Running Out of Time”. I believe this is the older one, and possibly done by the same artist as the first one. For grading her up to modern standards, she gets a pass from me. This book is available in the Kindle store and other marketplaces. She maintains a pretty well-built author’s webpage with all her books, even giving away press kits and additional insights to her books. She continues to write books, many of her older books receiving modern facelifts to still keep their appeal. There is no official e-mail or contact form to actually talk to her (I’m assuming because she’s “famous”), but there are Twitter and Facebook links to follow in lieu of that. In all, good book, good story, good read and great author to continue reading books from.